When it comes to films like this … I won’t! I won’t! I won’t! #JokeOnlyPeopleWhoveSeenTheMovieWillGet. I would like to see the Kendrick brothers adapt someone else’s script, maybe a Christian literary-canon author like Flannery O’Connor or Walker Percy or Graham Greene. It’s finally plain that they have no script judgement whatsoever, something COURAGEOUS lays bare naked because their technical and directorial chops HAVE gotten better. Their comedic work is amusing and I’ve seen far worse-made films at major festivals. 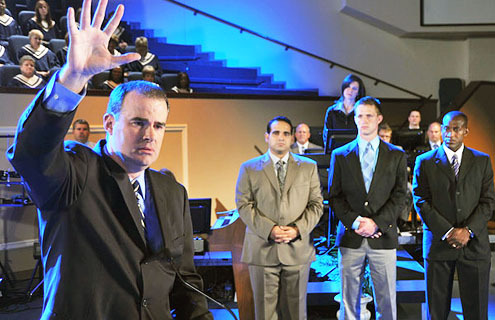 Brother Alex Kendrick (lead actor here) now also is a legitimate A-grade thespian. The first half of COURAGEOUS needs no affirmative-action scale, in fact. But the back half is even weaker than FIREPROOF in terms of sudden story arcs and skimped-on resolutions. One whole subplot of a man with daughter he’s never met is nothing but a voiceover and a couple of scored montages. And the homiletics really get heavier and heavier (Substitutionary Atonement dialog FTL!!!) until a final scene of Kendrick himself (supposedly in character, but hardly) delivering a fiery Author’s Message sermon from his church’s real-life pulpit. I wanted to flee. As was elaborated in a subsequent back-and-forth with Steve Greydanus (upon whom I threatened to perform grievous bodily harm per my extensive (and illicit) boxing/MMA training AND questioned his commitment to Sparkle Motion), I was really more than anything else disappointed by the raised expectations from both Steve’s earlier review and the film’s first half. The Kendricks are now legitimately good film-makers. They can direct actors to give natural, believable performances (other than the pastor to whom Alex turns shortly after the midway point). They have a dry if sit-commy sense of humor (“I love you”). They can stage chases and fights and gunbattles at least as well (actually far better in classical or “old school” terms) as some Hollywoof schlockbusters. Here, they also don’t shy away from darker subject matter. So why can’t they SEE how awful the third act is? You either don’t raise the “anonymous kid” story at all, or you do it some justice. Do they actually believe that jailhouse conversation? Do they have to slather pedestrian music with EXACTLY ON THE NOSE lyrics on montages of resolution? Do they not giggle at the closing scene? They don’t have the “novices making church films” defense any more.